In running Etang Bertie as a holiday venue we have two main aims, firstly that you find the fish and their environment in first class condition, and secondly that you have a happy and successful trip. To help us achieve this the following rules are in place. No vehicles on the grass. BBQ in the designated area only and please clean after use so that it is okay for the next party. No Litter, including cigarette ends. Take all bottles to the bottle bank before leaving. Using the boat is at your own risk, and should only be used when wearing a life jacket. Maximum of 3 rods, which must not be left unattended. No leaders of any kind. We are happy for you to bring and use a bait boat but they are not essential to catch, all the productive spots are well within straight forward casting range. Boilies are the usual number one choice of bait and a bait freezer is provided should you wish to bring freezer baits. Pellets should be those designed specifically for feeding to carp, not the bulk animal feed type pellets. We do sell pellets, which are the same as we feed the fish on over the winter close down. Any particles used should be of the ready prepared jars/tins type. You may use the boat for baiting up. Wear a life jacket at all times. Fish should be kept out of the water for the minimum amount of time, so please get camera equipment ready before lifting the fish from the water. Have an ample supply of water available to keep the fish and mats wet at all times. In the summer months the unhooking equipment can get very warm; please ensure they are thoroughly soaked before placing fish on them. If you catch one of the larger cats, a special cat sling and 120 lb scales are available. Very occasionally you might snag up in the margin reeds etc. If this happens we recommend the following. Firstly slacken off and give the fish chance to free itself and if that doesn’t work use the boat. Pulling for a break risks snapping off and leaving a fish trailing line. Carp care is the same wherever you fish, so please follow our fish care rules above. Some of the Etang Bertie carp object to being out of the water and can really “kick” so remember to keep the fish near to the ground and be prepared to get over it and hold it still if it does try to flap about etc. Big fish can do themselves a lot of harm if they are not restrained positively. For those of you not used to handling big cats the following might be of use. You can hold and move cats by gripping them by their lower jaw. It is like rough sandpaper to touch, so we recommend you bring a glove with your. Landing the bigger cats can be an issue. If it will not go in the landing net, them probable the best solution is to thoroughly wet the cat mat (or cat sling) slide one end into the margin, and then grip the cat by it’s bottom jaw and slide it up the bank. It is very easy to lose track of how long you have the cat out of the water, so please return the fish into the margin, get help etc. so you are organised for the pictures, weighing etc. 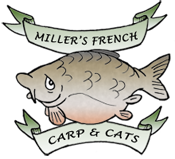 Both with the bigger carp and the bigger cats, it is our experience that someone is going to get wet and slimy… we are told it all adds to the fun!